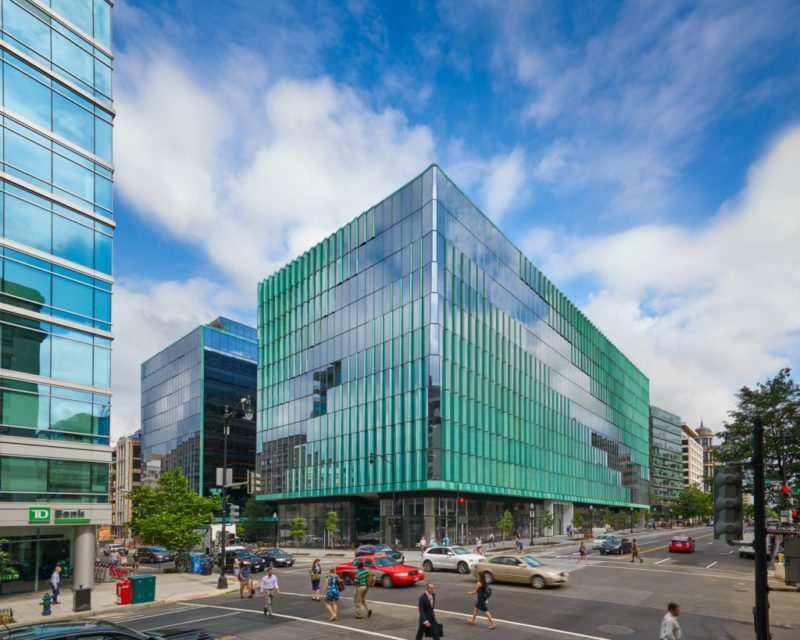 Carr Properties inaugurated Midtown Center, one of the most anticipated development projects in Washington, D.C.’s hottest central destinations, on September 12, 2018. The event was attended by over 150 special guests including Michelin Star Chef Nicolas Stefanelli, and distinguished guests from SHoP Architects, Clark Construction, WDG Architecture, project staff members, and brokers from the Washington, D.C. metro area. Designed by New York-based SHoP Architects, the 865,000 SF building boasts unique features such as two full-height curtainwall towers with copper cladding, three suspended bridges that connect the East and West office towers, and a stunning European style piazza designed to be a garden oasis in the center of the city. Inspired by the historic L’Enfant Plan, the plaza’s layout offers access to a gathering place and 45,000 SF of a unique mix of formal and informal dining, including a new Greek restaurant by Michelin Star chef Nicholas Stefanelli and Blue Bottle Coffee, ushering a fresh concept for Washington D.C.’s retail and commercial office experience. “We are honored to deliver a vibrant and relaxing destination in the center city for customers and the District’s residents alike.” said Oliver Carr, III, CEO of Carr Properties. After serving as the headquarters of The Washington Post for over 50 years, the site is now home to the new headquarters of Fannie Mae. It is located four blocks north of the White House, two blocks from Metro’s Blue, Orange, Silver and Red lines and close to neighboring prime commuting arteries, bike lanes and bus routes. Surrounded by over 3,500 nearby hotel rooms, and bordered by the bustling 14th Street Corridor, Midtown Center provides access to a dynamic work environment and vibrant activities in the heart of the city. Current office availabilities include the 4th and 5th floors in the East Tower totaling approximately 70,000 square feet. Midtown’s amenities are consistent with the building’s first-class LEED-Gold designation and include extensive green spaces with trees, shrubs, and perennials in the occupiable terrace on the 14th floor. The rooftop offers breathtaking views of the city, a lush garden experience, and a first-class conference center. Other building amenities include a 9,300 SF double-height fitness center with ultramodern cardio and weight-lifting equipment, Peloton bikes, and a yoga room; three levels of below-grade parking for retail patrons including electric charging stations and a 1,300 SF bike room to encourage greener modes of transportation. Carr Properties is a privately held real estate investment trust focused on creating value for its shareholders through the ownership, acquisition, and development of high-quality office properties in the greater Washington area. The company currently owns a portfolio of 17 commercial office properties totaling approximately 4.6 million square feet as well as three major development properties that include: The Wilson and Elm Development in Bethesda, MD; Signal House in the Union Market area of Washington, DC; and 2025 Clarendon Boulevard in Arlington, Virginia. Upon completion, these projects will add 1.2 million SF of trophy-quality office space to the company’s portfolio. The company is continuing to expand its portfolio through strategic investments in the Washington, D.C. area.